(CNN) -- Susan Lanier has always enjoyed getting out of her urban home in Chicago, Illinois. Camping is a cheap travel alternative to staying in a hotel. But her travel plan for this spring -- which includes riding on a Greyhound bus and camping in a national park -- is a new, more frugal version of how the 22-year-old would normally spend a vacation. "I'm in school and usually I'll do some sort of trip, but usually I'll go to a beach or something or I'll fly to New York," she said by phone while hitching a ride on a band's tour bus, headed toward the Smoky Mountains of Tennessee. "But [finances have] just been tight, and this is a cheap way to get out of the city and do something fun." 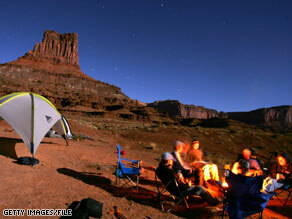 With the economy in a slump, camping seems to be grabbing a new foothold in the travel industry. Once considered by many to be an activity for nerdy families, nature geeks and Boy Scouts, sleeping outside in a tent has become chic -- likely because it is so much cheaper than paying for a hotel room. The activity also strikes a new chord with Americans who want to get back to basics after an era of excess and overspending. Outdoor camping's popularity jumped 7.4 percent between 2007 and 2008, according to a report from the Sporting Goods Manufacturers Association. Overnight backpacking is up 18.5 percent, the report said. "That's a significant change," said Mike May, the association's spokesman. "One thing about camping is once you buy a tent, you don't need to buy another one for a long time. It can be an inexpensive way to spend some recreational time." The group estimated there are 33.7 million campers in the country. May said he expects that number to continue to increase this year. REI, the outdoor equipment company, said tent and sleeping bag sales are up this season, particularly when it comes to larger tents designed for three- and four-person families. So far this spring, family tent sales are up 14 percent over last year, said Rick Meade, REI's product manager for sleeping bags and tents. For March, sales are up 28 percent over the same month in 2008. "We have a great sense that there is a resurgent interest in [camping], especially on the family camping side," Meade said. State parks are among the cheapest places to sleep under the stars. Many of the parks, which either are free or charge entry fees of about $10 per day, are seeing increased interest from tourists and campers, according to Phil McKnelly, executive director of the National Association of State Park Directors. "Whether you're talking about wanting to go to the ocean or the mountains, those are kinds of activities that can be done in a state park at a relatively low cost," he said. "For the cost of one of two nights in a hotel, you can spend a week in a state park." Still, the financial crisis is affecting states' abilities to manage their park systems. Most states have seen their parks budgets slashed by 10 to 15 percent, McKnelly said. That means fewer park employees, which translates into dirtier restrooms and trails blocked by fallen trees, he said. The Texas Parks and Wildlife Department began offering classes for first-time campers last year. Interest in the program, which teaches basic skills like how to pitch a tent and dispose of trash in an eco-friendly way, has been high, said Tom Harvey, spokesman for the department. So far the state has offered the program to more than 1,200 people, according to the department. iReport.com: How are you having fun for free? "We'll hold them by the hand and we'll show 'em how to pitch a tent," he said. "It's been very popular." Harvey said the camping movement is geared at more than recreation. People who live in cities often don't understand natural systems, which he said can lead to detached and unhappy lives. "We are now, most of us, creatures of the urban jungle and we're losing our connection with the natural world, with reality," he said, adding that camping helps fix that. In California, many state parks are booked well into the spring, said Sheryl Watson, spokeswoman for California State Parks. On the first day reservations became available, 20,407 people reserved a July trip to a California state park, she said. That's up nearly 13 percent over last year's reservation numbers. By comparison, reservations were up 4 percent from 2007 to 2008. Watson said parks near the state's urban centers are especially popular, because camping can be an inexpensive way for someone to visit a city like San Francisco, where hotels can cost 10 or 20 times the price of a camping spot. That idea also applies to international level, where hotel costs can add up over a long stay. The economy has given people like Lanier, the student in Chicago, an excuse to spend more time outdoors. The last time she went camping was six years ago, in high school. Lanier said she bikes around Chicago often, but the city's best outdoor offering is Lake Michigan, and that still feels pretty urban, she said. Lanier is studying fiction writing in a masters' program, and said she plans to record her campfire conversations with her traveling buddy, who plays in a band called I Need Sleep and will also offer some free musical entertainment. She hitched a ride on the band's tour bus to Tennessee. The only part of the trip she dreads is the $50, 18-hour return trip by Greyhound bus. While she felt pressured into the trip by the economy, she said that may be a good thing in the end. "It just seems like an adventure -- something different," she said.